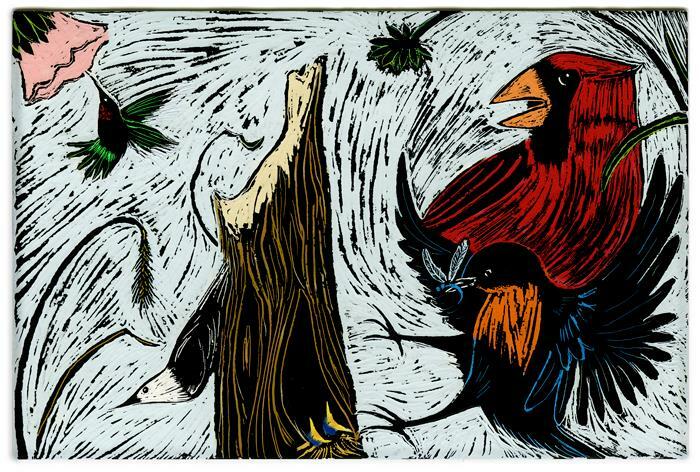 Bird photographer and illustrator Christine J. Shanks of Oddbird Creative and landscape photographer and artisan woodworker Anthony Smith will present works on paper and wood that explore birds and their habitat. The duo are life partners who are creatively inspired by the outdoors and who often work collaboratively. The diverse pieces in the exhibit utilize transfer techniques, reclaimed wood, white toner printing, and laser etching and cutting. The Good Truck will be on premise from 6pm – 9pm with your favorite tacos, tortas, and a delicious dessert. So come look at some art, eat delicious food, and play games on the lawn. Bonfire at sundown. From 6:00-8:30 we will be joined by Elijah Joseph Weber-Han of The Electrozone fame who will be demoing some instruments of electronic madness. Movie starts at 9pm sharp and is weather dependent. August’s outdoor motel movie features ornithological thriller horror content from Sonoma County California.